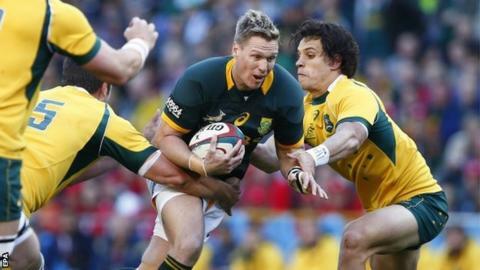 Two late tries by captain Jean de Villiers and another from Pat Lambie helped South Africa beat Australia in the Rugby Championship in Cape Town. The Springboks trailed 10-5 at the break but a Handre Pollard penalty cut the gap early in the second half. The home side finished strongly in the final 10 minutes with Lambie giving them the lead with a drop-goal. De Villiers scored twice and replacement fly-half Lambie added a late solo effort for the home side. The win moved the Boks to within a point of unbeaten New Zealand in the table, but the world champions later clinched their third successive Rugby Championship title with a 34-13 win in Argentina. The Boks were below par but kept scrapping and their incessant pressure in the closing stages paid off as they punished a tiring Australia to the relief of the crowd in the Newlands stadium where the Wallabies have not won since 1992. Marcell Coetzee had got the opening try for the home side but Australia, who looked strong for 60 minutes responded with a try for winger Adam Ashley-Cooper while fly-half Bernard Foley kicked a conversion and a penalty. Although South Africa were forced to defend strongly as Australia pressed, they found an extra gear going forward as the game went on. Lambie missed a penalty which would have given his side the lead but made up for the miss with the drop-goal before a Cornal Hendricks break led to De Villiers diving over with nine minutes remaining. Lambie showed his strength to extend the lead with a try before De Villiers crossed again with the final play of the game to increase the home side's lead. South Africa coach Heyneke Meyer: "Australia's defence was awesome in the first 60 minutes and we were frustrated at times. "But the players that came off the bench upped the tempo and were brilliant. Last year we scored the most tries in the competition, I know we can score when we keep the ball in hand." Australia coach Ewan McKenzie: "I feel sorry for the players, they set the game up for the win and that won't be reflected in the final score, it will probably be forgotten. "There was some really good stuff from our guys, we were in a good position to win it. We will have to look at the video and see why we didn't." South Africa: le Roux, Hendricks, Serfontein, de Villiers, Habana, Pollard, Hougaard, Mtawarira, Strauss, J. du Plessis, Etzebeth, Matfield, Coetzee, Mohoje, Vermeulen. Replacements: B. du Plessis, Nyakane, van der Merwe, Botha, Burger, Reinach, Lambie, Pietersen. Australia: Folau, Ashley-Cooper, Kuridrani, M. Toomua, M. Toomua, Foley, Phipps, Tomane, Slipper, Faingaa, Kepu, Carter, Simmons, Fardy, Hooper, McCalman. Replacements: Hanson, Robinson, Alexander, Horwill, Higginbotham, White, Beale, Horne.